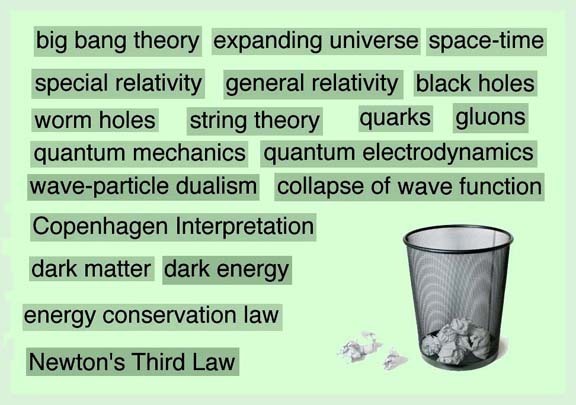 Over the years a considerable amount of rubbish has accumulated in the field of physics. Examples of such rubbish are the theories and laws depicted above. It is time that the slate be wiped clean. Retain the observations, but dispense with the flawed theories. Subquantum kinetics offers a new way of looking at the universe which makes these theories obsolete. The following failings are discussed both in the book Subquantum Kinetics and in papers accessible through many of the links provided on this website. The big bang theory is seriously flawed and incompatible with observation. In particular, the expanding universe hypothesis has been shown to make a poor fit to cosmological test data, while the tired-light, stationary universe model has been shown to make an excellent fit. There are serious problems with both special and general relativity explored in a number of papers. In particular, experiments showing signals propagating at superluminal speeds directly refute the special theory. The rod length and clock rate alteration observations that they attempt to explain are better explained by subquantum kinetics. The notion that there is such a thing as a space-time coordinate system that can be warped has also been shown to be flawed. Cosmological observations show that the geometry of space is Euclidean, not curved. Observational evidence fails to support the existence of black holes. With the exit of the space-time warping concept, we may also get rid of the idea of worm holes. A major fraction of the physics community is disenchanted with string theory which in 35 years has failed to yield any testable predictions. The quark/gluon theory has been disproven by a key proton spin experiment and also fails to predict the observed wave character of the nucleon’s charge distribution. Quantum mechanics is flawed because it is based on Schroedinger’s wavepacket representation of the particle which itself is plagued by the problem of dissipating over time and of creating an observer paradox in defining its characteristic wavelength. The wave-particle dualism is out dated by the finding that the electric field that comprises the nucleon is modulated with a unique wave pattern allowing both particle and wave characteristics to be simultaneously explained. Probability theory and the Copenhagen interpretation which maintain that only measurements have any objective reality is based on a positivist philosophy which has been disproven now for many decades. It is better replaced by theories such as stochastic electrodynamics which acknowledge the existence of a real substrate that is in a state of continuous fluctuation. The concept of “collapse of the wave function” also needs to be tossed out along with quantum mechanics, since the new physics no longer subcribes to the wave-particle dualism concept and hence has no need of wave functions in need of collapse. Besides, Jean-Paul Vigier, deBroglie’s protoge conducted an experiment that disproved the wave function collapse hypothesis bringing this worn out theory to its final collapse. Quantum electrodynamics is entirely a conceptual construct. No one has proven that electrons continuously exchange virtual photons between themselves when they scatter. This concept may be replaced with the subquantum kinetics notion of ether concentration gradients causing dissipative solitons to accelerate. Dark matter and dark energy are entirely theoretical constructs created to patch up the inadequacies of standard astronomical and cosmological theory. The new approach of subquantum kinetics has no need for them. The energy conservation law is good for describing the functioning of refrigerators and a few other 20th century technologies, but the reality is that Nature for the most part violates this law. The cosmological redshift is evidence of nonconservative energy loss behavior taking place throughout the universe. The Pioneer effect, planetary-stellar M-L relation, supernova and galactic core explosions are evidence of nonconservative energy creation taking place in all galaxies throughout the universe. Moreover numerous technologies ranging from maglev and asymmetrical capacitor propulsion to parametric amplifiers and HOH gas generators provide abundant evidence of over-unity energy production. Many of these technologies, such as the electric field propulsion of asymmetrical capacitors and electrogravitic propulsion, show that Newton’s Third Law can be routinely violated. While Newton’s Third Law may be good for describing rocket and jet propulsion, it has to be discarded when dealing with the field propulsion technologies that are now emerging in our present era. Your article has been reposted on the Semir Osmanagich Facebook page I administer.